The City of Fayetteville plans to redevelop and reinvigorate the Ramsey Street corridor. Improving the transportation system is part of the plan, with goals of decreasing congestion, improving community safety, and enhancing mobility. Fewer and better placed driveways, new signalized intersections, more internal and peripheral connecting streets, convenient transit stops, and walkable community areas are part of the plan. High crash rates along Ramsey Street, one of Fayetteville’s most highly-trafficked retail strips, prompted a 2006 traffic study. While the Ramsey Street Corridor Plan calls for a more walkable community, businesses along the corridor were skeptical about their livelihood if motor vehicle travel within the corridor was adversely affected. The US 401/Ramsey Street project jointly planned and funded by the City of Fayetteville and NCDOT created a small economic boom for business owners, helping them re-envision the street as a pedestrian destination. The roadway project converted center turn lanes to raised medians and improved the pedestrian network, reducing crashes and increasing revenue for businesses. The project is part of a larger effort to redevelop and reinvigorate the entire corridor. Ramsey Street is a north-south street serving a diverse range of institutional, commercial, and residential uses between downtown Fayetteville and 9 miles north of I-295. The City of Fayetteville envisioned a remake of the corridor to benefit for residents, business owners, employees, and visitors. The plan development process included community involvement, which helped guide the plan’s outcome and gain needed support for its implementation. Community feedback as part of this effort was to limit expansion of commercial activities to those areas primarily serving in this capacity. Prior to beginning the Ramsey Street Corridor Plan, transportation was of concern for those living within and using the corridor. Many felt that additional traffic signals, better street network connectivity, fewer motor vehicles, and pedestrian network improvements were needed, along with expanded connectivity to area parks and public facilities–especially the Cape Fear River Trail–was a high priority for the community. While safety issues exist along most of Ramsey Street, the project limits were based on high crash rates along a 4-mile section between 401 Bypass (Country Club Drive) and Melstone Drive. The roadway is a five (5) lane 72-foot wide roadway with a shared center left turn lane. A 2006 traffic study revealed high motorist and pedestrian crash rates for left-turning vehicles entering and exiting traffic via uncontrolled commercial driveways. Safety needs were compounded by an incomplete and unfriendly pedestrian network characterized by sidewalk gaps, long distances between crosswalks, and frequent interruptions of pedestrian travel by driveway aprons. 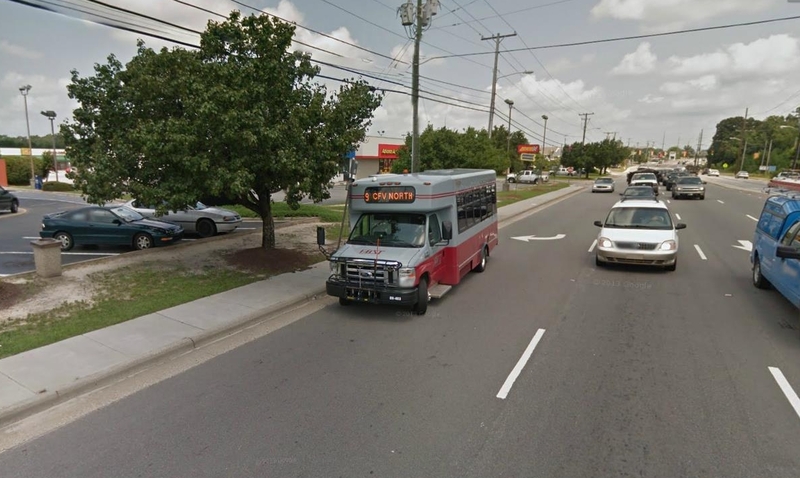 Long distances between designated pedestrian crossings and bus stops locations serving FAST (Fayetteville Area System of Transit) bus routes resulted in pedestrians frequently crossing the broad arterial street at mid-block, where they had few options if they became stuck in the center lane. Increasing traffic volumes add to overall safety concerns for destination shoppers and through traffic alike. Fayetteville’s Outer Loop provides east-west travel on the northern edge of Fayetteville, and currently brings motor vehicle traffic onto Ramsey Street. Traffic volumes will likely increase as Outer Loop extensions are built, exceed the corridor’s capacity. Figure 2. BEFORE: Ramsey Street’s median-less expanses were a safety concern for residents crossing the street.Credit: LandDesign, Inc.
City of Fayetteville Senior Planning Engineer Rusty Thompson saw a growing problem for pedestrians and commercial businesses, and submitted a corridor study request in fall 2006. 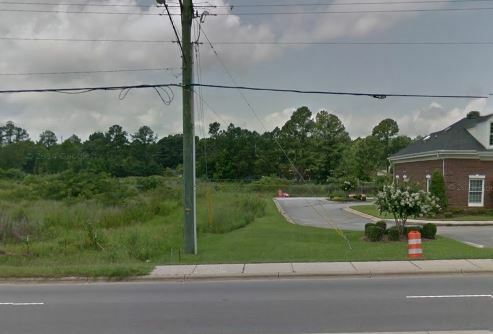 By early 2007, NCDOT hired engineering firm PBS&J to gather traffic data and public input on the issues facing Ramsey Street as an addendum to a scheduled resurfacing. The project was identified as a prime opportunity to address the community’s safety concerns along the road, as David Phipps, a Division 6 Regional Traffic Engineer recalls. 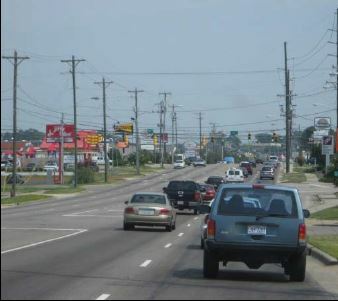 NCDOT engineers determined that a raised median in combination with strategic access points would reduce crash rates and maximizing the community’s use of the corridor. The consultant’s report showed strong linkages between site design and overall crash patterns. Public support for NCDOT’s recommendations slowly gained traction over a series of three public meetings on the project. Business owners in particular expressed concerns that restricted access to driveways would discourage business, but the majority of businesses are customer destinations, which meant it was unlikely that medians would adversely affect patronage volumes. In 2009, city council voted to approve the changes. Within a year, federal Highway Safety Improvement Program funding was approved for the project. Phase one of construction began in 2010 the addition of medians and landscaping, and sidewalks were added until 2012. The City’s concurrent sidewalk improvements enhanced connectivity for pedestrians throughout the corridor. Local traffic engineers answered questions and made adjustments as the project developed, leaving time for the public to adjust to the new driving patterns. The City applied $500,000 in New Freedom funds towards sidewalk improvements, while NCDOT’s Highway Safety Improvement Program (HSIP) funded $3.37 M in improvements. The City installed 2.5 miles of new sidewalks along the corridor, with curb and gutter at driveways as needed. The City also improved bus stops, resolving gaps in access to stops (sidewalks, curb ramps, and landing pads) and installing shelters at some stops. NCDOT contributed raised medians with landscaping, retrofitted directional crossovers and other channelization designed to reduce crashes and smooth traffic flow along US 401. Bulb outs were installed at pedestrian crossings and landscaped refuge islands were added at several median breaks. Preliminary data analysis has been overwhelmingly positive; since the project’s completion, there has been a 40% reduction in total crashes per year along Ramsey Street. As the area becomes more of a destination area, motorists have begun to adjust to the new traffic patterns. Mr. Phipps credits the project’s success to the ability of local leaders to recognize the joint opportunity for improvement. He also points out the importance of local project support, especially for projects like Ramsey Street that restrict or limit access. Mr. Thompson agrees that the public’s positive attitude shifts towards the changes and open communication between NCDOT and City leaders were critical to the joint implementation of the improvements. “Retrofitting median islands within existing cross sections was challenging, but it can be done successfully even when typical new location design standards can’t be followed,” Phipps said. Kimley-Horn and Associates. (2012). Ramsey street corridor implementation- market study. Retrieved from: http://www.ci.fayetteville.nc.us/files.aspx?do=showfile&id=1320. LandDesign. (2009, January 9). Ramsey street corridor plan. Retrieved from: http://www.ci.fayetteville.nc.us/files.aspx?do=showfile&id=82. PBS & J. (2008). Ramsey street corridor traffic study. Phipps, D. (2014, July 8). Discussion of US 401 Project. Phillips, G. (2014, Jan 8). Fayetteville plan aims to get state approval for new roads, improvements. Fayetteville Observer. Retrieved from: http://www.fayobserver.com/news/local/fayetteville-plan-aims-to-get-state-approval-for-new-roads/article_01b0a594-8bb1-5e25-a87a-ec82ef174aeb.html. Thompson, R. (2014, July 3). Discussion of Ramsey Street Project.